In Dutch road design a street can either be a through street or a street with so-called “end destinations” (homes, businesses) but not both. This way of thinking about mono-purpuse streets was formalized in the ‘Sustainable Safety’ policies, but the practice of building streets that way is much older. The problem with policies is that there is a reality with a design legacy that doesn’t always follow those policy principles. It is a fact that there are homes and other end destinations on through streets. So the Dutch had to come up with a solution to that problem, and they did. Meet the Ventweg. The literal translation of that word would be “way for door to door selling”. Such a street can probably best be described in English as service street or road. Schematic view of the service street: a street parallel to a main carriage way to provide access to end destinations. System of service streets. In orange: service streets with shared use of motorized traffic and cyclists (the red asphalt streets in the video), in red: connecting separate cycle paths. The central carriage way has a higher speed limit than the service street. In the Dutch tradition service streets run parallel to either side of a main center carriage way. They are usually one way and give access to the end-destinations in the street (homes or businesses). The service street is also the place where motorized vehicles can be parked. The service street is interrupted at (major) junctions so it does not provide an alternative through route to motorized traffic. The service street separates through traffic from traffic that needs to be in the street. It thus keeps the main carriage way totally free of movements that would slow down or endanger traffic, such as parking movements and entering and leaving private properties. It also makes it possible to have different speed limits on the main carriage way and the service street. Nowadays the main carriage way usually has the legal maximum speed limit for the built up area: 50 km per hour (31mph) and the service street has the normal speed for residential areas: 30 km per hour (18mph). This lower speed limit on the service street makes it fit for shared use with cyclists. By connecting the different service streets by cycle paths that do continue across the junctions, cyclists are provided with a safe route without the need of separate cycle paths all the way. It is becoming more and more common that service streets are redesigned to be ‘cycle streets’. The difference being that they are even more distinguished from through routes. After the redesign cars are guests as the priority shifts to cycling. This is indicated by the red colour of the smooth asphalt. For cycling the route is improved by a better surface and that priority. This is precisely what was done to a street in ’s-Hertogenbosch recently. The video shows the before and after situation in the first part and then continues to show what the rest of the route looks like until it reaches a residential 30 kph (18mph) zone. 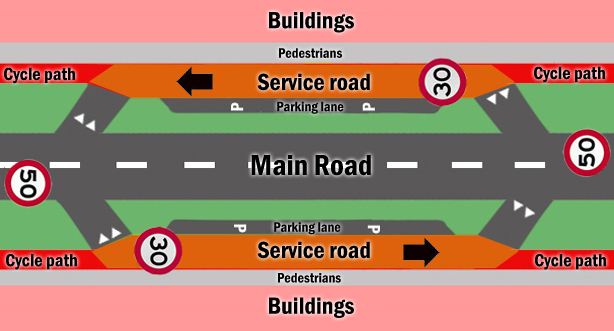 The picture gives a schematic view of the same street. The video starts at the bottom right of the picture and shows the street all the way to the top. Since about the 1970s newly built through streets in the Netherlands have been designed in such a way that they do not have end destinations. Most streets with service streets are therefore older. Sometimes the service street was retrofitted. In the original situation there could have been two streets next to water in the center. Left 1961, two streets with water in between. Right: 1968 the water is replaced by a center carriage way, the former streets are now service streets. The above pictures from Utrecht show a street in 1961 with two separate streets next to water and in 1968 when a central main carriage way replaced the water and the original streets became service streets. In other situations the center may have had a tram track or a narrow green zone. But streets were also designed with service streets from the beginning. The street from the video was designed that way. This can be seen on the picture from 1938. Graafseweg, the street we see in the video in 1938 shortly after it was first built. The video shows a before and after: from ordinary service street to cycle street where cars are guests. Mark, how wide is the cycle street (just the red paved part)? It looks about 3.5 metres, but it’s hard to tell from a video. P.S. Thanks for your great work! Yes 3.5 meters sounds like a good estimate. I am a civil engineering student in Tanzania-East Africa. I want to know how to determine the traffic loading during the design of a SERVICE ROAD.Should i use the loading on a main road and apply some factors on it? What are these factors? Please help. Not a single overpassing by any car during the entire video. It means that the probability of an accident is really very small! I just didn’t like too much cyclists that look like they were coming in the wrong way. Does not seem too safe. I don’t know if it was a correct behaviour? I guess yes because I remember that if you do something wrong by bike in the Netherlands, you get a fine pretty fast! I stayed 6 month in Holland and on my first bike day, we only didn’t get a fine because we were not Dutch and it was our first day! The policemen released us without any fine this time. The reason was that we did not stop at the pedestrian traffic light in a place were no car was to coming, something usually done in France even if illegal at that time in France (I’m French but live in Brasil). In fact, I then started to stop at all traffic lights by bike. It was pretty effective! I only started back not to respect all traffic lights again recently when I’ve seen that it does not necessarily increase the cyclist security. There are some exceptions. This the probably the case here in my city Vitória-ES in Brazil at a specific place where cyclists does not have other options than sharing the road with an heavy traffic avenue. Not respecting the traffic light adds some small risks but it also means that almost much less car will overpass the cyclist in this short region… Luckily I deviate this avenue very soon but most cyclist in my town take the short pass going on on the risky avenue. A lot of people do not care too much about loosing 4 minutes in order to improve their security. These service streets can be one-way for cars and two-way for cyclists, though in this case the signage indicates it’s one-way for cyclists too: note the lack of “uitgezonderd fietsers” (“except cyclists”) sign below the one-way signs at 3:00 and 3:45 (compare to the sign at 4:19, where there is a “uitgezonderd fietsers” sign). The service street in the video is a bit less wide than the ones I’m familiar with, that’s probably why they haven’t made it two-way for cyclists. I’ve seen some similar situations here in California. One of the main streets – Shattuck Ave – in Berkeley, California has service streets parallel but instead of creating through routes for cyclists with a bike path, the service street terminates at each intersection with a sidewalk bulb out. Many cyclists do use the service street though mid-block but there intersections aren’t without their troubles. More locally for myself, San Fernando Road in Northeast LA has a service street though it is awfully car-centric and even allows two-way traffic for much of it. The service street has the benefit of being partially covered in shade, which is important for cyclists here so we don’t get too much sun exposure. Last weekend I went swimming with my family, and chose the bike over the car. The weather was scorching hot, but the roads were lined with trees and covered in shade. The larger roads were blocked with cars waiting to get into the recreation area, burning in the sun. Yes, trees are important! It seems the whole idea of planting trees along roads has been abandoned since the rise of the car, in many cities at least. Shade and shelter and a pleasant view are an important part of our experience of the environment. I remember my first arrival in Bangalore, India: a beautiful city with streets lined with orange blossoming trees. Nowadays it is much more congested and filthy, but in some areas they still can be seen. Very interesting. The area of London where I live actually has many service roads comparable to those you show, alongside main roads. It is actually a favourite idea of planners to try to route cycle traffic on to these service roads. But it does not work here, and cyclists tend to prefer not to use the service roads. Then the planners wonder why. There are several reasons. One is as Christopher mentions above, cyclists on service roads loose priority over minor side roads, which they would keep if they cycled on the main road. Another is that the service roads are disconnected. If you can only cycle for 100m along a service road before having to rejoin the main road, and you have an extra visibility risk and possibly delay in rejoining the main traffic stream because you used the service road, then there is no point. Because at the main junctions generally there is no provision for cyclists, cycling in the service roads is no help. Where the service roads end, near main junctions, the building line usually comes close to the road, so it is not obvious where cyclists can be put here. To create connectivity would require significant re-engineering of the streetscape, above the budgets allocated for these schemes. The other big difference is in the parking in the service roads. What is shown in the video is very specifically organised parking spaces off the service road, with a nice clear, wide path for cyclists, generally on the building side of the service road. Service roads in London look very different, with quite disorganised parking everywhere, both sides on the service road, often on the pavements as well. There is generally no nice, clear safe path for cycling. Another factor is that the surfaces of the service roads tend to be poorer than the surface of the main road. They are often concrete when the road is tarmac, or they have potholes. Taken together, these are the reasons why UK cyclists do not want to cycle on service roads, even though we have lots of them. They are a combination of problems of design, resources, build-quality, and enforcement. They could all be overcome in principle. This would be a good thing to emulate in the UK, where some arterial roads, typically with 1930s housing, have service roads. Here, however, they are generally arranged very badly for cyclists, giving way to side roads that cross the service road to the main carriageway, and usually ending or going around a corner at junctions with other major roads. It would not be beyond the realms of possibility to re-arrange them so that they continued onto a cycle path where motor vehicles rejoined the carriageway. Brilliant and detailed explanation of service streets in NL and great blog, by the way. I have a few friends who are working hard to promote the use of bikes in the city of Buenos Aires and they might find your blog interesting, so I’m sharing this! Brilliant as always Mark. What is happening at the end of the video? The bike lane disappears and the road suddenly narrows. I noticed the car to your left followed the other road around to the left. Is the road you are on blocked to cars? At the last shown junction the main road continues to the left and straight on we have entered the 30kph zone of the old historic city center with very narrow streets. That is no through route for motorised traffic. So it is not blocked but motorised traffic only goes there if they need to be there. Since it is a 30kph zone (18mph) the separate cycling infrastructure is not needed anymore. This entry was posted on 21 May 2012 by Bicycle Dutch in Original posts and tagged ’s-Hertogenbosch (Den Bosch), infrastructure, ride, service street.